Looking for a new way to eat salmon? 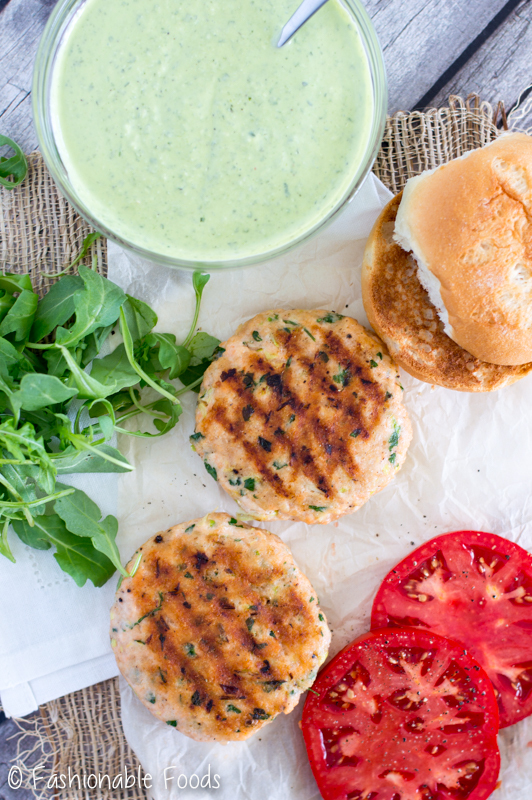 Look no further than these delicious salmon burgers with basil green goddess dressing! One bite and it’s bound to become your favorite summer meal! Happy Friday! This week has flown by and I’m finishing it off with another recipe update. I posted these salmon burgers just over 2 years ago. They remain one of my favorite meals… and I hated the photos, so I thought it was time they get some updating! I also wasn’t thrilled with the text of that post, so I’m writing a new one to go along with the new photos! ? So, do you guys have any fun plans for the weekend? We have friends coming to visit… so that means lots of food and wine. It always seems when friends are here that all we do is eat and drink wine. Nothing wrong with that, though. Right? ? When it comes to summer meals, I like things light and fresh… and these burgers are exactly that. Fresh salmon filets are pulsed in the food processor with scallions, parsley, and garlic until it’s all combined. Then, mix in an egg, breadcrumbs, and a little lemon. Form your burgers and you’re ready to cook! My favorite way to cook the salmon burgers is on a grill pan. You won’t be able to make these on the outdoor grill because they are just too delicate for that. If you don’t have a grill pan, you can use a skillet, or you can even broil them. 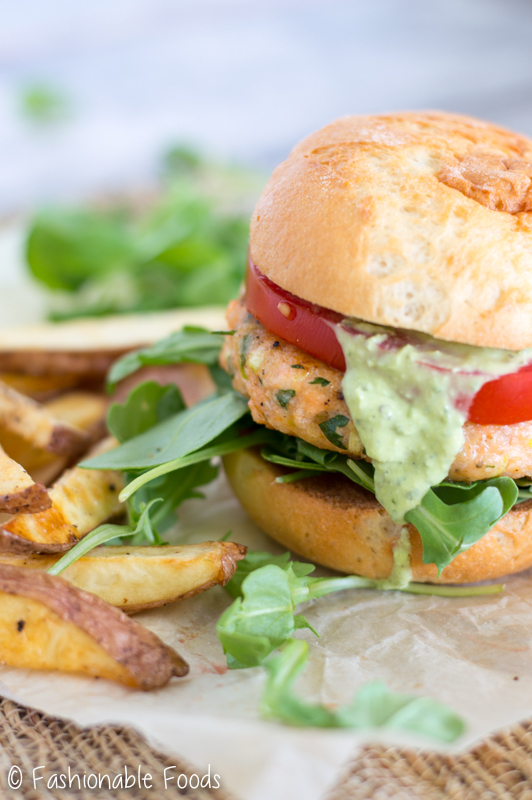 To serve these tasty salmon burgers, I go with arugula (my fav), a big slice of tomato… and the star of the show: basil green goddess dressing. I’m a huge fan of green goddess dressing. It’s so fresh tasting and full of summer herbs. 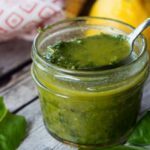 Traditional green goddess dressing is usually made with mayo and sour cream, but to lighten things up a bit I use greek yogurt. For the herb combo I use fresh basil and chives – that basil makes it taste so summery! Oh, and it wouldn’t be green goddess dressing without the anchovies. If you think you don’t like ’em, think again. They are in lots of stuff that you probably love (caesar dressing) and don’t even know it. So, don’t leave them out! I generally prefer thinner dressings on my salads, but for the salmon burgers I like to make it thicker and more like a sauce. If you want it for salads, you can simply thin it with a little water to make it easier to drizzle. The dressing can also be used as a dip for veggies… and whatever else you can dream up. Trust me, you’re going to want to put this on everything! 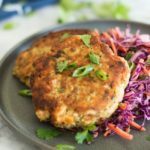 You definitely need to give these salmon burgers a try – I think they will quickly become one of your favorites! They are definitely one of mine. ? Looking for a new way to eat salmon? 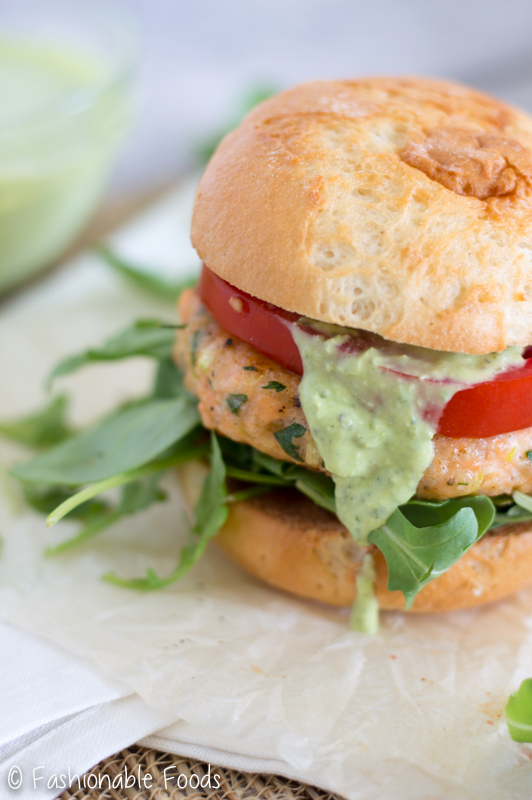 Look no further than these delicious salmon burgers with basil green goddess dressing! One bite and it's bound to become your favorite summer meal! In the bowl of a food processor combine the cubed salmon, parsley, scallions, garlic cloves. Pulse until combined. In a bowl, combine the lemon zest and juice, almond meal,, egg, salt, and pepper. Add in the ground up salmon mixture and gently mix. Form the mixture into 4 large burgers and place them on a paper towel lined plate. This will soak up any excess moisture. Heat a grill pan over high heat and lightly oil it. Grill the salmon burgers for 3-4 minutes per side or until they have nice grill marks on each side and are cooked through. Serve the burgers on buns piled with arugula and top with a tomato slice and lots of the green goddess dressing! I love salmon burgers too! Sometimes beef burgers are just…too much…I feel to heavy and weighed down. 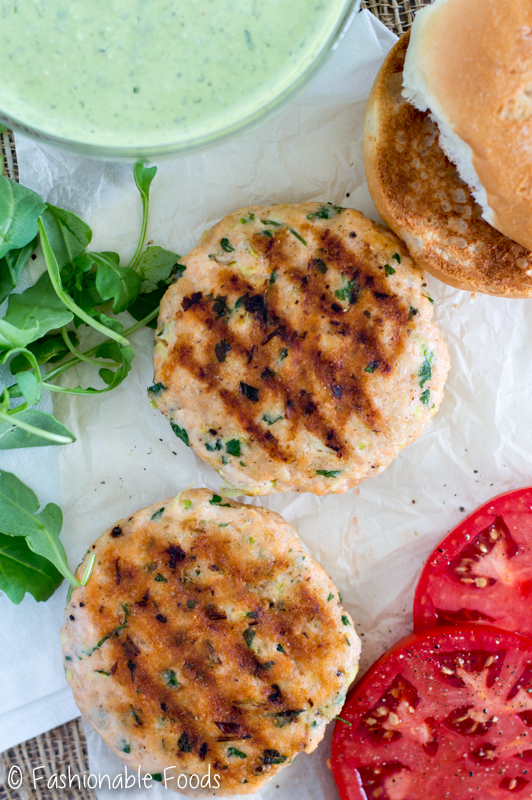 Salmon burgers are where it’s at! 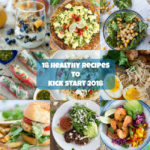 Love that you added green goddess dressing too! I agree Natalie! I’m obsessed with these for summer! I love salmon, but have never had a salmon burger OR green goddess dressing. These look delicious both on a salad or a bun! You need to try Rachelle! They are my favorite for summer! 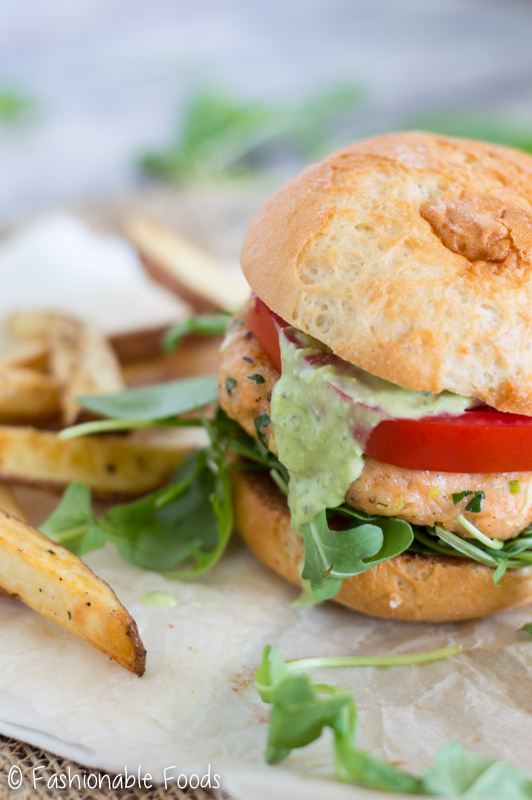 Can you believe that I’ve never had a salmon burger?! I need to change that asap, as salmon is my favorite! I love the dressing on top, Keri! Looks just perfect! Mine too Kathy! 🙂 Thank you! I’ve never had a salmon burger! It looks delicious. We eat salmon every week and I’m always trying to change it up a bit so this will definitely be added to the rotation. 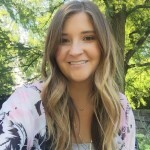 And I totally feel ya on blogging in the summer…I’ve just been making my husband grill every night because I don’t want to stand in front of the stovetop! Yes you definitely need to try a salmon burger! Yes, the heat is brutal for cooking. I only wish I could have an outdoor grill so that I could avoid the kitchen all together! These looks so amazing, Keri! I want these right now!! Definitely going on my “must make” list :). I LOVE salmon burgers! And these look amazing! Especially with the green goddess sauce! I’m pretty sure I missed these epic burgers the first time around, so I’m so glad you decided to re-post them! AND you took new photos AND wrote new content?! Daaang girl! Look at you go! Anyways, these look FABULOUS! 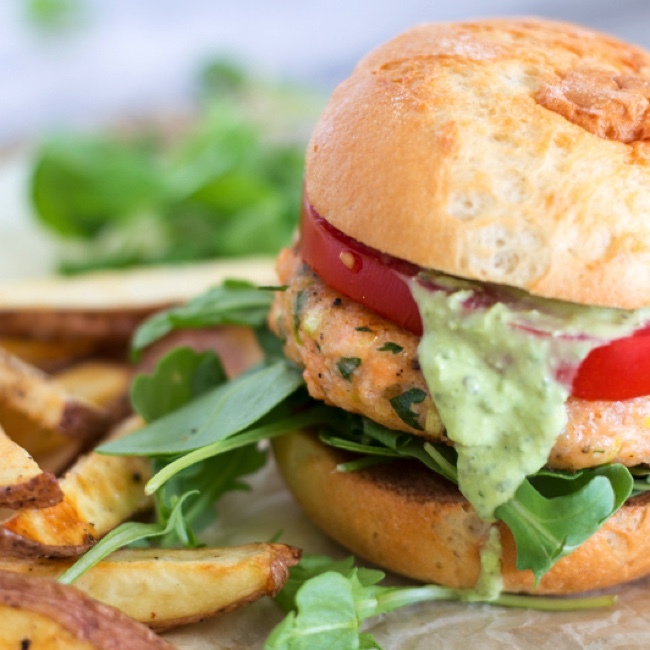 I’m obsessed with salmon and green goddess dressing, so you better bet these burgers will be making an appearance here in the near future! Pinned! Cheers! I saw a similar recipe. Yours is better! The softer taste turned out.